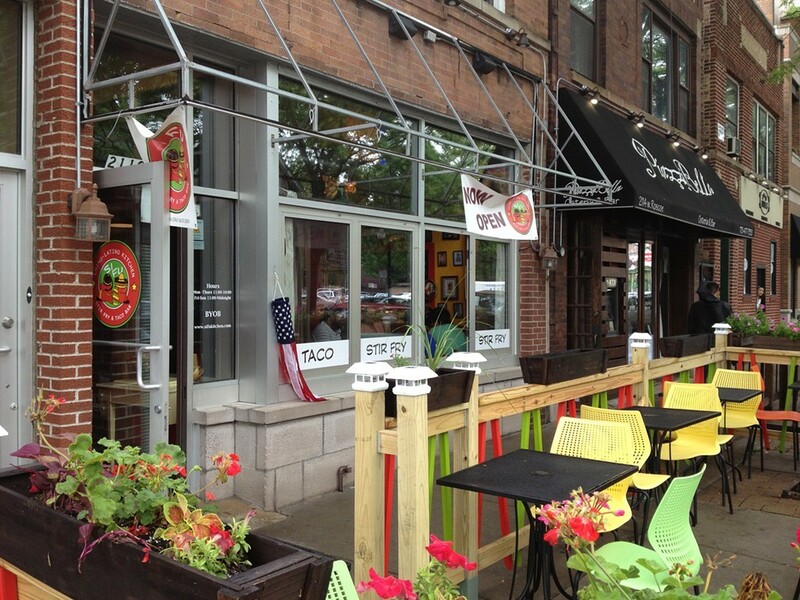 Between the Jerk Taco Man and the Colombian hot dog, last week was a feast of inspiring culinary collisions, so I was hoping keep it up at Roscoe Village's Si Fu Chino Latino, an Asian-Mexican taqueria that, frankly, sounds like a concept that could have been fleshed out after the catchy name was dreamed up. The logo hung under the unconstructed awning sports the unfortunately ubiquitous sombreroed, serape-draped hombre napping it off next to a faceless Manchurian with skullcap and ponytail. Ohhhh, I think I get it. Inside you'll walk between walls crammed with similarly cliched bicultural gimcracks and gewgaws and customize your own tacos at the counter in the rear. 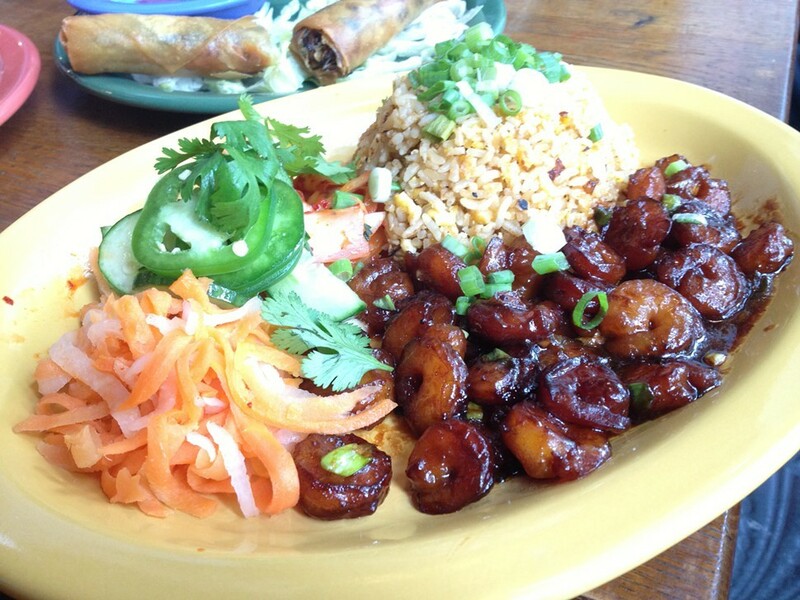 You have your choice of flour, corn, or hard-shell tortillas filled with a choice of proteins like cilantro-lime chicken, caramelized shrimp, teriyaki mushroom, carnitas, or Mongolian beef. Then you choose a garnish set, either the "Chino" choice, featuring your standard banh mi toppings of picked daikon and carrots, cilantro, cucumber, and the "Latino," with onions, cilantro, and lime. 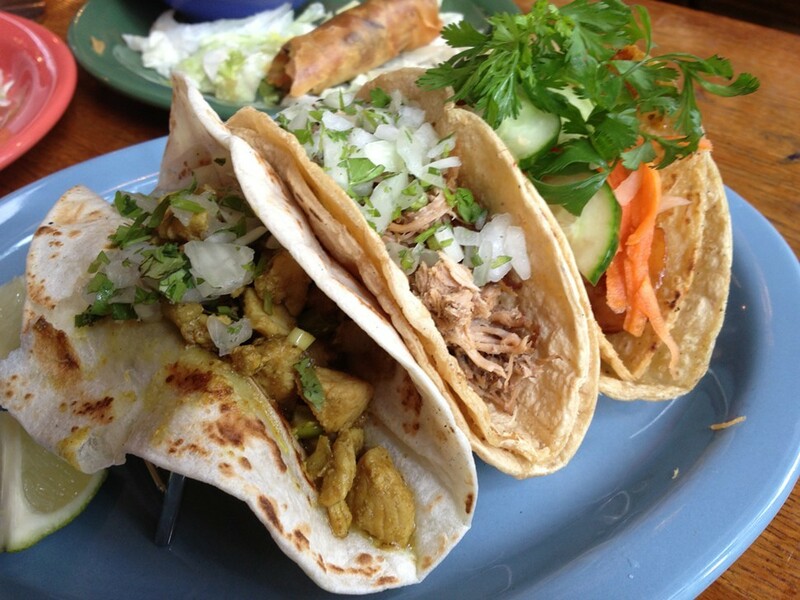 There's really nothing but your own sense of dignity to prevent you from making choices like a Latino coconut-curry seitan taco in a hard shell or a Vietnamese carnitas taco in a flour tortilla. 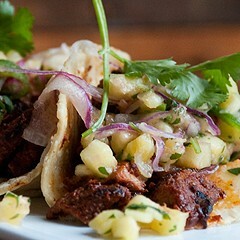 Tacos are $2.88 apiece, but a trio for $7.88 makes a good test of the kitchen's facility with these divergent ingredients. My straight-up Latino carnitas taco was packed with spent, dried out meat that unintentionally made a cross-cultural connection for its resemblance to Chinese pork floss. The bland coconut curry couldn't help the equally parched chicken breast chunks go down either, but the shrimp, shellacked with a sweet-and-spicy glaze, coordinated well with the Asian toppings. In the end there was no finishing any of these on the stale, cardboard tortillas they arrived on. The menu fills out with a few appetizers: empanadas, guacamole and chips, thin, greasy egg rolls, and a surprisingly appealing crab rangoon with curry-spiked cream cheese. The whole Chino-Latino M.O. can also be applied to sopes, burritos, and salads, but the best thing I tried was a shrimp stir fry ($7.88) that mixed up well with brown fried rice, banh mi toppings. Altogether, it was the only indication that guests are meant to taste anything at all.